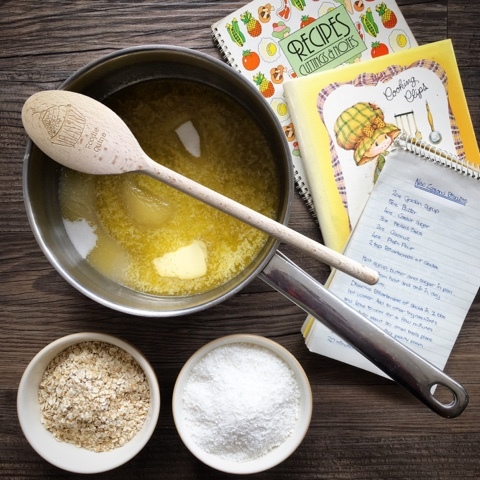 The recipe I'm sharing today is one that my Mum baked regularly throughout my childhood and teens. There always seemed to be a batch of New Zealand Biscuits in the round mustard coloured Tupperware tub! I never knew then why they were named as such, however a quick Google and it seems they can also be known as Anzac Biscuits which is particularly appropriate as it's Anzac Day on the 25th of April. According to Wikipedia an Anzac Biscuit is a sweet biscuit, popular in Australia and New Zealand, made using rolled oats, flour, desiccated coconut, sugar, butter, golden syrup, baking soda and boiling water. Yup that's pretty much the New Zealand biscuits I know and love. Alas there has been somewhat of a twenty year gap since I last had a New Zealand Biscuit but I remembered them with fondness and had chased my Mum for their recipe but she couldn't remember where it had originally come from or find it written down anywhere. I had a good look through her various handwritten recipe books, ripped out magazine pages and clippings but to no avail. However back home I discovered exactly what I was looking for in a teenage reporters come recipe notebook of my own. There are a few other childhood favourites in there that I remember my Mother and Grandmothers making so expect to see Ministers Slices, Cornflake Biscuits and Gingerbread putting in an appearance on the blog very soon, all served up with a slice of nostalgia. Just need to find my Grandma Corntowns recipes for Girdle Scones and Ecclefechan Tart now. Back to Wikipedia to find out more about Anzac Day; A national day of remembrance in Australia and New Zealand that commemorates all Australians and New Zealanders (ANZACs) who served and died in all wars, conflicts, and peacekeeping operations and the contribution and suffering of all those who have served. There appear to be a couple of different theories about the origins of the Anzac Biscuit. One being that they were sent by wives to ANZAC soldiers serving abroad because the ingredients didn't spoil easily so they kept well during naval transportation. Another is that they were sold to raise money for the first world war effort at galas and fetes where they were also known as soldiers biscuits. Can't beat a wee bit of food history. In my next life I'd absolutely love to come back as a food historian. Think I've left it a bit late in the day for this one. Melt the golden syrup, butter and caster sugar in a large pan. Remove from the heat and mix in all of the dry ingredients. In a small bowl, dissolve the Bicarbonate of Soda in the tablespoon of hot water and add to the pan mixing well. Leave to cool for 5 minutes. Divide the mixture into teaspoon sized pieces, you should get at least 30. Roll into balls and place on greased/lined trays, flattening them slightly and leaving plenty of room in between as they will expand. Let them firm up for a couple of minutes on the tray before carefully moving to a cooling rack with a fish slice. 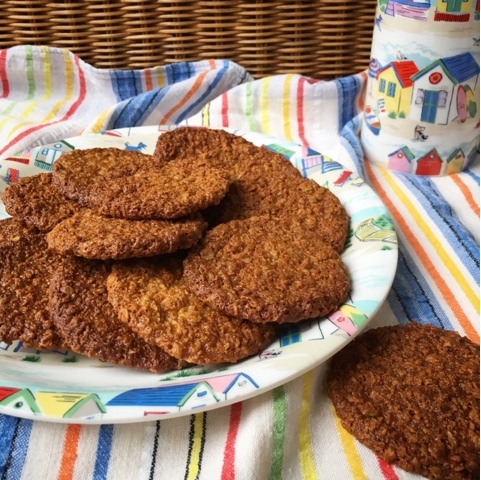 For more oaty biscuit recipes check out Janice's Treacle Bites and Chocolate Chunk Melting Moments, Helen's Ginger Spice Cookies and Easy Museli Cookies and Isabella's Ginger and Oat Cookies. 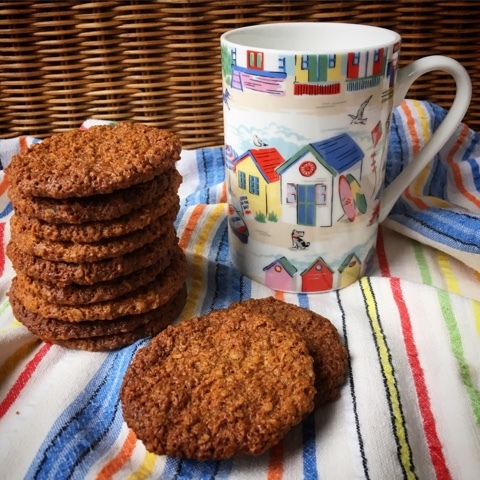 I've seen anzac biscuits a few places today - probably a message that I should try some! I love coconut, so I reckon they would be a winner. Never too late for Food History... love the nostalgia connected to these, and look forward to seeing the others from that Reporters Pad! Never say never! There will definitely be more to come from my reporters notebook. What about Australia? I do hope you love it too! You are most welcome. Thanks for hosting a great challenge. These look so good Claire. I vaguely recall making something like these with my mum when I was a girl. I think she used a recipe in her well used Bero book (though I may well be wrong). I love these older recipes and the history behind them. Lots of people talk about a Bero book but my Mum never had one. I feel like I missed out! Oats are so good in a cookie. Loving the sound of your ginger ones. If you wait long enough everything eventually makes a comeback. Even food trends. Shame on you! Definitely give them a try, really easy to make and fun to do with the kids. I got almost 40 in this batch out of such a small amount of ingredients. Love a thrifty biscuit! Beautiful photography. 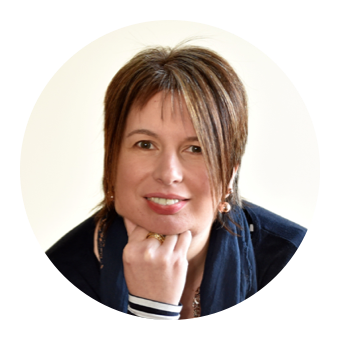 Thank you for linking to #Inheritancerecipes. We love to have you there. 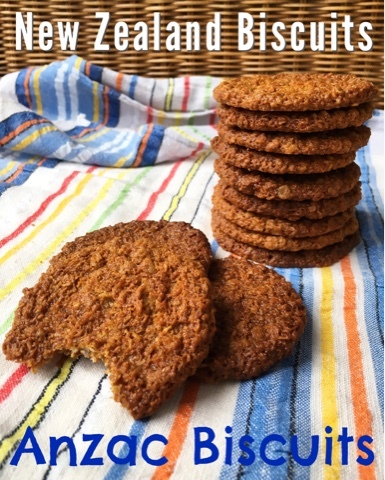 I've never actually eaten an Anzac biscuit but they sound very good! Thanks for joining in with #BAKEoftheWEEK ! Oh you really must try one. I'm just rather embarrassed that I'd been eating them all this time but never knew that's what they were! Competing theories are always good. That's what make it interesting. I bet that now you've come across them you'll see and hear about them everywhere! Isn't that always the way?! Yummy biccies and food history. Its a win win situation! 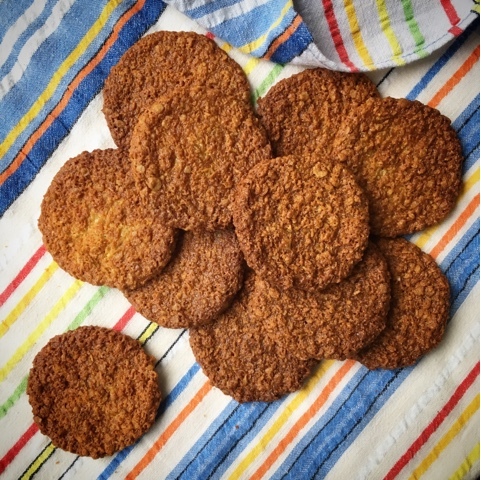 I've never made Anzac biscuits but I really need to as every single time I see someone sharing their version of the recipe I think they sound amazing - just my kind of flavours. This was the first time my kids had tried them and they practically inhaled them! Do give them a try.